Solgar Tonalin CLA provides Conjugated Linoleic Acid (CLA), an exclusively licensed trademark of BASF Personal Care and Nutrition GMBH. Conjugated Linoleic Acid (CLA) is an omega-6 fatty acid and can often be found in dairy and beef fat. The amounts of CLA obtained from the diet are usually much lower than the amounts that can be obtained from dietary supplements. Fatty acids are lipids, the general term for dietary fat. The body can make several fatty acids, however, those it cannot make in adequate amounts must be obtained through the diet (essential fatty acids). 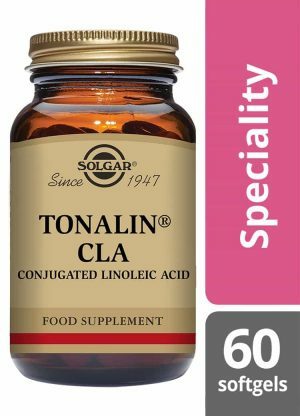 Solgar Tonalin CLA is derived from safflower seed oil, providing 1014 mg of Conjugated Linoleic Acid (CLA), taken as a softgel, twice daily. Tonalin CLA (from safflower seed oil), Softgel Capsule Shell: (gelatin (from bovine), vegetable glycerin (from palm oil, palm kernel oil, coconut oil, rapeseed oil, sunflower seed oil)), Colour: natural caramel.